In 1812, Elinor Pembroke wakes to find her bedchamber in flames—and extinguishes them with a thought. At 21, she is old to manifest magical talent, but the evidence is unmistakable: she not only has the ability to start fires, but the far more powerful ability to control and extinguish them. She is an Extraordinary, and the only one in England capable of wielding fire in over one hundred years. BURNING BRIGHT is the first installment in author Melissa McShane's The Extraordinaire's. 21-year old protagonist Elinor Pembroke is a late bloomer when it comes to receiving her talents. So when she wakes up and learns that she is an Extraordinary Scorcher, one who can set fires, and put them out, Elinor finds herself at a crossroads of sorts. In McShane's world, there are talented individuals who have magical gifts like Seers, Bounders, Movers, Speakers, and Shapers. Elinor is the first Scorcher in England in over a hundred years. After being a nobody for so long, her tyrannical father, who keeps track of all talents, now wants to control who she marries and damn if Elinor has a voice in the matter. Elinor is now a valuable commodity that her father can use to marry above her station. Even though it is against the law for a man to purchase a bride for the sake of her talents, that doesn't mean that her suitor can't offer a nice sized bribe to the woman's father. Talents also cannot be forced to marry against their will, but that won't stop her father. After refusing her father's choice of suitors, Elinor makes her own decision. It's a decision that puts into the arms of the Royal Navy in a spectacular fashion. The same Navy who for years has resisted bringing women into their service, unlike the Army who takes Extraordinaires of both sexes. As an Extraordinaire Scorcher, Elinor is given a chance to prove herself and finds herself on board the Athena with Captain Miles Ramsay. Ramsay is another Extraordinaire called Mover. He not only can move heavy objects, but he has the ability to fly as well. Athena also has a Bounder on board in Mr. Harvey and a Shaper in surgeon Peregrine Hays. Elinor must prove that women deserve a chance onboard ship. Especially one as powerful as she is. Elinor is nobody's pushover. She has to deal with misogynistic admirals, lieutenants, and crew who believe that women on board ships is a horrible idea. A factual reference to men claiming women on board ship angers the gods and cause horrible conditions and bad weather. Above everything else, Elinor becomes part of the crew who learn to respect her and her abilities after she brings the fight to the enemy. She, in turn, is loyal to the crew of Athena. When she is temporarily sent to another ship, and it sinks, she finds her way back on the Athena for the action-packed fight against the Pirates. 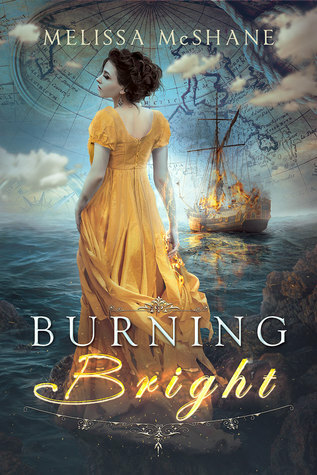 I am going to say that if you liked Pirates of the Caribbean and Master and Commander: The Far Side of the World, you will love BURNING BRIGHT! I loved that this story is slow on romance but high on action and adventure. The romance really is in the background until the very end which didn't hurt my feelings. McShane spends most of the story on the battle between the British and Colonial Navies against the Brethren of the Coast than it does on romance. It doesn't take long to fall in love with Elinor and her struggles to fit in, and how she learns to understand her abilities in the time of great need. Ooo what a pretty cover, that alone makes me want to read it but your review definitely makes me want to give it a try as well. Great job! This cover looks sooooo great! Thanks for sharing. Sounds like an exciting read! I'm glad to hear the romance is a bit slow or not as pertinent to the story! Sometimes it's just not needed as much. This looks really good and I like the sound of the story. I am also in love with that cover. Hmm. Some of these elements here remind me of a YA story I read. Very similar in some ways. Thanks for sharing! The cover really is lovely. Total eye catcher. Glad you had such a good time with it!